CureShoppe.com is the proud sponsor of 528 Products, 528Revolution.com, 528Records.com, 528Radio.com, Dr. Leonard Horowitz, and Sherri Kane. Please peruse our online catalog, including the “528 Store” for helpful 528 products endorsed by Dr. Horowitz and Ms. Kane. For a complete listing of 528 products in various categories, CLICK HERE and access the “Store” menu pop-up from the “528 Products” tab. 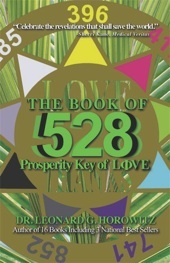 Your purchases help sustain the “528LOVERevolution,” including The Book of 528: Prosperity Key of LOVE. Dr. Horowitz’s research into 528Hz sound/528nm light is extraordinary and wonderful. Evidence from the world of science, physics and mathematics, encourages 528 applications that can potentially heal people and our planet of deadly commercial impositions, such as infectious diseases, cancers, HIV/AIDS, heart diseases, dehydration, starvation, and more. This is why the 528Revolution encourages 528 applications and technologies that can contribute to solving the world’s worst problems, including energy cartel impositions, since 528 revolutionaries believe the “power of love” is capable of solving every urgency, and curing every malady, most efficiently. 528 research and developments of new products, many advanced by Dr. Horowitz, provides hope for a healthier future, and a promise of LOVE/528 that is historic.